Dimensions of Antique Cabriolet Armchair : 92 h x 62 w x 52 d cm. Antique ArmChair height : 41 cm. 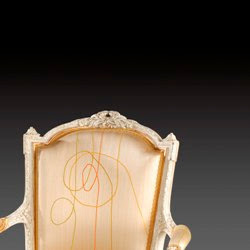 This Antique Cabriolet Armchair enchantingly beautiful armchair of the Louis XVI era is the manifestation of the talent of Jean-Baptiste Sené, who, like his congenerates Boulard, Jacob and to a lesser extent Tillard, has been able to propose this grace bordering to Mannerism, however, tempered by the force of the simple and pure lines. The rich décor please also view antique Italian Living room, culminating in a laurel crown, runs via measured lines and is superbly drawn : “rais de coeur”, acanthus leaves, laurel, spirals and other decorations come together to create a virtuous concert. Without, however, reminding us of the heavy and artificial pompousness of the Versailles court like antique table and always remaining a harmonious chair that is certain of its beauty. 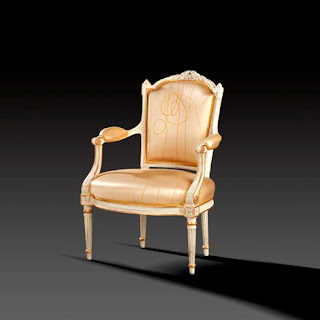 One can without hesitation classify this chair among the delicate and luxurious chairs like antique italian chair of its time.